Inspired by The Daily Zoo, Keeping the Doctor at Bay with a Drawing a Day and The Daily Zoo, Year 2, Chris Ayers has created MY Daily Zoo to get the creativity of the young and old alike brewing! This activity book will provide page upon page of exercises that will provide YOU with ample opportunities to create your own personal zoo of characters. Some examples of what you will find within the cover – an octopus with the ends of his tentacles missing, you get to add what you would like to see held in the eight spaces, scribbles that get turned into characters with scribbles drawn to inspire your own characters, design a tortoise shell, a hippo tattoo, a bowling team's missing members, the dog show's competition line up, animal splicing (parts of different animals are provided for you to create your own). 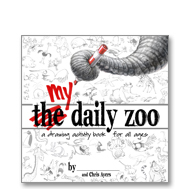 Have no fear, this book of artistic challenges will be started off with a step-by-step drawing follow-a-long: showing a line by line (shape by shape) progression of drawing a Daily Zoo character – provided with blank spaces next to each step for one to follow along. Categories: artist series, Books. Tag: chris ayers.